Meet Twin sisters Gabriella and Olivia and step into their world of crushing heartbreak, constant fear and anguish. 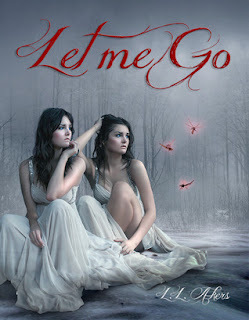 Reading 'Let Me Go' was almost like an out-of-world experience for me, like I was watching myself read the book, but I was right within those pages, looking out at the person holding the book. It is a story about a trio of sisters struggling to cope with abuse, while trying to fight for their families survival. And 20 percent of me agrees, there may have been slight exaggeration in a handful of chapters, for dramatic purposes, but apart from that, I'd say Akers hit the mark dead on. The issue with domestic and or sexual abuse is, and will always be, that you can never judge the severity of it unless you've experienced it first hand, no matter how much you've read up on it. That's just how it is, you may disagree with that, but that is the truth. Like reading all about being an Olympic Swimmer doesn't make you any more qualified than the next guy. The sad reality is- the stories we encounter in Let Me Go are sadly not uncommon and it pains me to read reviews where people speak about it like it's nothing, a mere term that holds no importance whatsoever. As if one was just discussing the weather or what they've had for dinner. It's an issue that has weighed heavy on my mind for a couple of years now, but I won't get into it too much otherwise this review will spiral completely out of control! I've watched so many families being ripped apart by the effects of all different kinds of abuse, (my mother being one of those women affected) that reading and reviewing this book was very important to me on a very personal level and I truly enjoyed getting a copy early on to do just that! There is so, so much that can be learned from this book, it almost overwhelmed me. Issues like- why does a victim try to keep it all a secret? Surely the first thing you'd do is tell someone? But I'm afraid it's not quite that simple. That said, I think it's safe to say that it was very easy for me to connect with each of the 3 sisters. I truly appreciated just how much research had to have gone into the making of this book, especially as it was written purely as a work of fiction, with no 'real' truth to it. On a different note, I found it incredibly refreshing that the characters in the book were portrayed as normal girls, no perky blondes with troubled hearts but otherwise flawless appearance, but girls who share their mistakes and let you into their hearts, which for me, resulted in buckets full of tears and raw emotion. There will always be someone to support you. If you need help, get it. No matter how dark the way. Thank you so much for such a powerful review. It can be hard for someone who has experience abuse in their lives, even through other family members, to read about it--but you managed to put that aside and objectively review Let Me Go. Thank you also for your voice giving advice to victims as well. Great review. It's terrible that this sort of thing happens every day and so often goes unnoticed. I'm glad you found such a powerful book about a touchy subject! Cheers again, guys! Looking forward to more great stuff! I hope this comment isn't repeated; I've tried twice to post and I think failed. Would you please consider copying this review to GoodReads and Amazon.US? I've only had 2 of the bloggers post, and one of them, although 3.5 stars, not so good. I don't understand as all the other good reviews aren't showing up at GoodReads/Amazon. This one is my favorite! Please post! Great review! I was part of this tour as well. I thought the book was incredible.